Chief Minister Virbhadra Singh was given a rousing reception on his arrival at Killar today on beginning of his five days tour of tribal areas of the State. Member Parliament, Mandi constituency Pratibha Singh and Forest Minister Thakur Singh Bharmouri also accompanied the Chief Minister. Chief Minister laid the foundation stone of Mini Secretariat building at Killar to be constructed at an estimated cost of Rs. 20.80 crores. On completion it would provide the facilities to the people of area for getting their works pertaining to various departments done under one roof. The six storied building would have Resident Commissioner, SDM, BDO, Agriculture, Veterinary, I&PR and other offices alongwith parking facility. 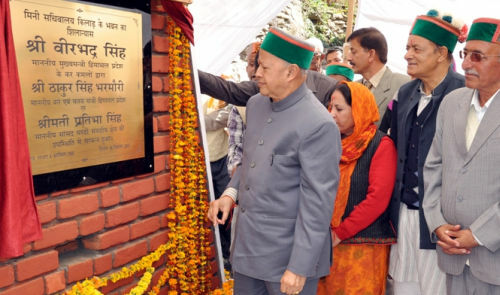 Speaking on the occasion Virbhadra Singh directed the officers working in tribal areas to complete the on-going works keeping in view the limited working season in these areas so that the they do not hamper due to adverse weather condition in ensuing winter. He directed the officers to complete the construction work of Government Degree College Killar and Hospital building at earliest. Chief Minister said that tribal areas of the State had rich cultural heritage which needed to be preserved and promoted. He said that the State Government was making efforts to promote these areas as religious tourism destinations. He said that famous temple of Mata Mindal would be taken under Government control and proper upkeep and maintenance would be done to facilitate the pilgrims. 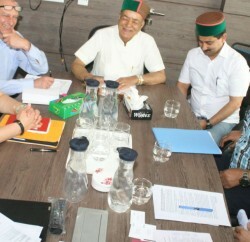 Virbhadra Singh said that the present State Government had made significant achievements during last nine months and many important decisions had been taken which would go a long way in accelerating the development of the State. He said that previous Government had neglected interests of the people and various jobs were provided on the basis of party lines whereas the present Government was committed to provide jobs on ability and merit basis. He said that the State Government was endeavouring to fill up all the vacant functional posts in tribal and hard areas of the State and preference would be given to the local youth. Chief Minister said that the State Government was striving to connect tribal and hard areas with tunnels, which would not only reduce the distances but would also boost tourism activities in these areas. He said that a tunnel would be constructed at Chehni and Rs. 30 lakh have been sanctioned for conducting its survey. Chief Minister announced to upgrade Government High School Karyuni to Government Senior Secondary School, Government Middle Schools Shore, Phindru and Karyas to Government High Schools and opening of a Primary School at village Chlasri. He also announced to open HRTC Sub-Depot at Killar and Veterinary Dispensary at village Chaloli. He announced the construction of foot-bridge at Sandhari. 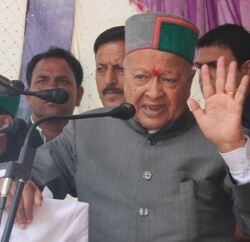 Virbhadra Singh announced Rs. 10,000 each to Mahila Mandals who presented cultural programme on the occasion. He also announced Rs. 5,000 each to the school students who presented National Anthem and National Song. Chief Minister also inspected the Hospital and work of College building which is under construction. M.P. Pratibha Singh thanked the people of Pangi Valley for their overwhelming support to ensure her victory in recent held elections. She said that Congress Governments had always given top priority to the development of tribal areas. She said that matter regarding installing TV tower at Killar and improvement in BSNL services in area would be taken up with the Central Government She thanked Prime Minister Dr. Manmohan Singh and UPA Chairperson Sonia Gandhi to introduce the Food Security Act, which would ensure that nobody remains hungry in the country. Forest Minister Thakuri Singh Bharmouri while welcoming the Chief Minister said that Pangi area of Chamba district remained neglected by the previous Government and people suffered a lot as many posts in various key departments remained vacant. 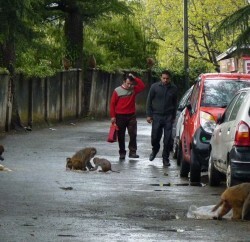 He requested the Chief Minister to fill up the vacant posts of Pangi area on priority. He thanked the Chief Minister to sanction Rs. 30 lakh for the survey of Chehni tunnel. He also apprised the Chief Minister about various demands of the area. Tribal Advisory Council Member Ram Charan Rana and Member BoD Forest Corporation Subhash Chauhan also spoke on the occasion. Advisor to Chief Minister T.G. Negi, Principal Secretary to Chief Minister & Tribal Development V.C. Pharka, Resident Commissioner Pangi Inder Singh Bhardwaj and prominent persons of the valley were also present on the occasion.